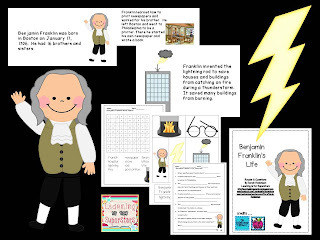 Today I am linking up with Kacey at Doodle Bugs Teaching for my Five for Friday! 1. 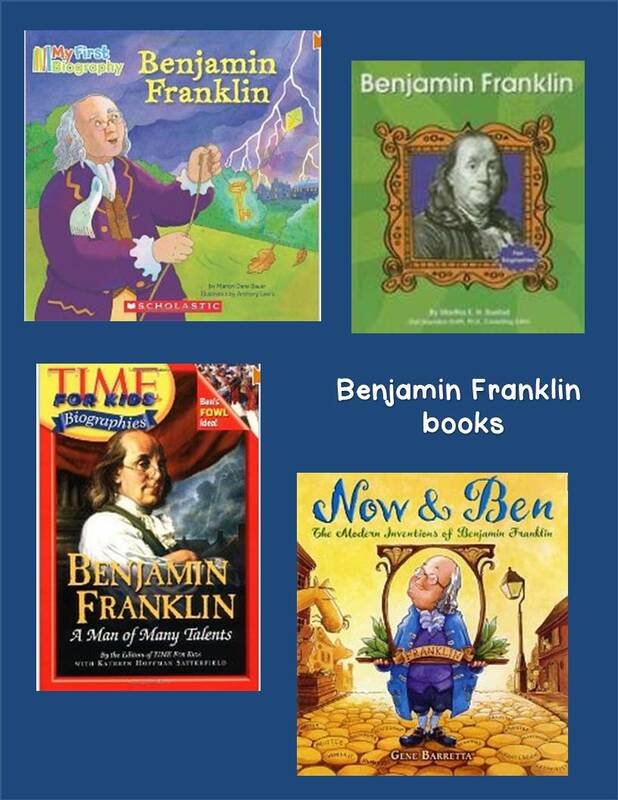 This week we learned about Benjamin Franklin. 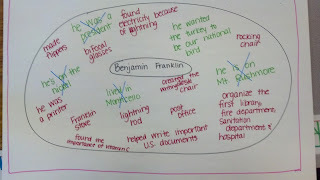 We read several different books, read an original book, and worked on a circle map. 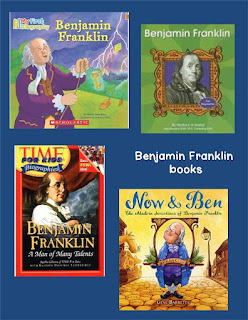 Here are some of my favorite books about Franklin to use with primary children. I found Now and Ben while visiting Philadelphia last summer. It's a fabulous book! 2. In central Virginia, we can experience all of the seasons in a matter of a few hours and we certainly saw that this week! On Wednesday we had a snow day! By 11AM we had approximately 3 inches of snow, which was coming to an end. The sun came out and melted the snow, bringing the temperature up to about 40*. Today it was 52* and it is supposed to climb through the weekend! 3. 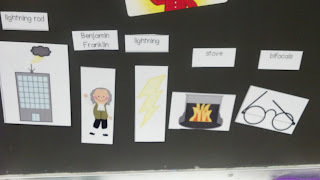 This next week I am starting something I have not done as a first grade teacher ... centers. It terrifies me! I had the chance to observe one of our kindergarten teachers last week to especially see her centers at work. Maggie's been a K teacher for 30 years and I value her ideas and suggestions! Anywho, this is my craft for the art center for the next 2 weeks. Click on the picture or here to see the original pin from pinterest. I picked up bags of cotton balls, as well as coloring books and new crayons from the dollar store tonight on my way home. Maggie and Denise (our other K teacher) suggested having something extra at that center for early finishers, so new coloring books it is! 4. I have worked this week on a packet of plural/singular nouns. The standards require our first graders to correctly use plural nouns. For the most part, my children do well, but some of them struggle with man/men and not mans! I have not yet finished my preview pictures or posted it in my store, but I will give away 3 of them! Be one of the first three to comment AND leave an email address to receive a set! 5. We finished our money unit today. Do you hear me singing "Hallelujah!"?? Many of my children came to me able to count a collection of mixed coins, but for the few who still struggle to correctly identify the coin and how much it is worth (even after singing the "Elmo Counting Coins" song every single day for the last three weeks! ), I am glad it is over! Time is next for us. What math unit are you covering? We are finishing up money. 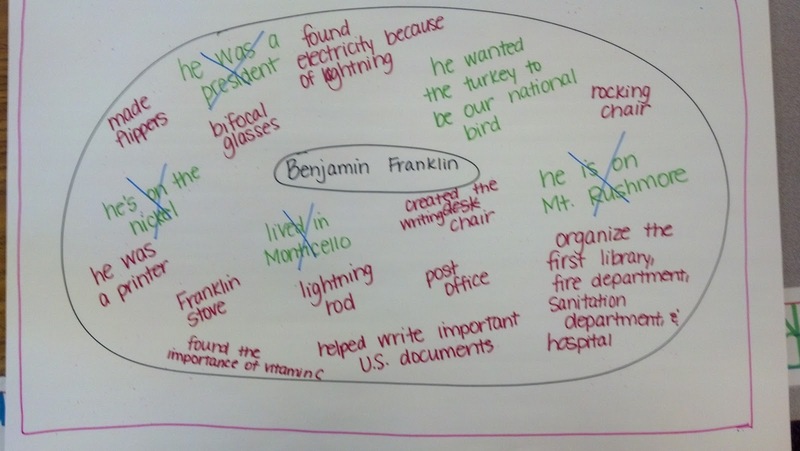 I didn't do a whole lot with it as it isn't in the first grade common core. There is so much more to cover, I don't know how we will get it all done! We move on to time too. I am going to have to check into the Elmo Counting Coins song! 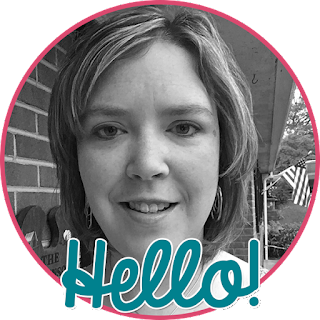 Virginia is not using the common core, so I feel "out of the loop" with so many other bloggers. I didn't realize the common core doesn't require money for first grade! How much is required for time? Money is the hardest thing for me to teach. We use Think Math and it kinda jumps all over the place sometimes. 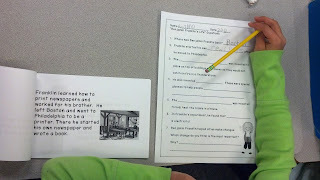 :) This week we did comparing weights and comparing two-digit numbers. Next up is measuring. Love that picture on the side of your blog of your grandfather reading...so sweet. Money isn't in the standards anymore in TN for K or 1....which is ridiculous. It's such a hard concept. We are still going to cover it this year even though it's a pain. They need to learn about it! Plural/singular nouns can be hard for kids. Thanks for sharing.